Normaltivity » No Diet Weight-Loss Plan Miracle! Despite the spam-like title of the literature, what Dino has done here is write something that seems to, at least, be caught up in our cultural moment, despite the fact that he is not a doctor, and perhaps his claims are even incorrect. But what use does a Dinosaur have with facts and figures and studies and theories? He is but a simple Dino, and to him, issues that plague men are but simple problems with direct solutions. Also, that book bought him his sweet house. Incidentally, in the linked article (from Time Magazine), the author notes something about being hungrier after exercise. Does this happen to a lot of you? I find that after exercise I am generally less hungry – particularly if I was feeling a bit hungry going in. I don’t know what is happening there. Perhaps my body is consuming itself. The article, however, also talks about how people like to “reward” themselves with treats or fatty foods after their workout. This is another phenomenon I do not understand! While I was attending University, I worked for a while at a juice and smoothie establishment (I won’t say their name, but it does rhyme with “Samba Juice”). As it best fit my schedule, I often found myself working the night shift. And because the gym was right across the street, we would get many, many customers who had clearly just exercised. Now, don’t get me wrong. I understand the general principle behind the intake of supplements following one’s workout. We had stuff for those people. What I don’t understand is the decision to drink 500 calories of almost pure sugar that has little benefit. One particularly trying customer used to attempt to convince me that it was healthy. I pointed out to him that he was drinking 500 calories of pure sugar on top of his 2-item combo from the Chinese food place (protip: it rhymes with “Man, duh, Express”) and that he was likely negating whatever work he did. Whose theory was correct? All I’m saying is, I lost 10 pounds that semester. And that jerkface earned his Freshman Fifteen. In college, I got a little…husky. I went from a bony 120 lbs to a rotund 180 lbs in the course of a freshman year. Of course, I thought they said “freshman 50,” and didn’t think I was doing too bad. Nevermind that I managed to gain more weight my freshman year than many of my friends did when they were pregnant. I managed to lose much of the weight due to ribbing from my friends, and a lot of exercise. 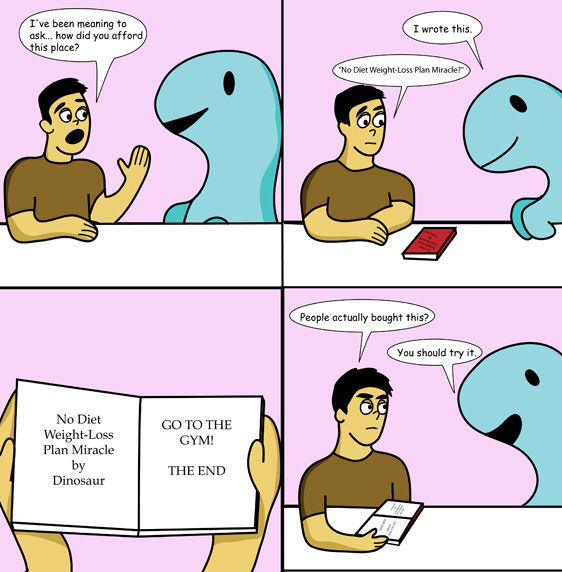 Man people asked me what plan I used, if I went on a diet, and all of that stuff, but all I really did was go to the gym. Sure, maybe abstaining from ice cream as breakfast may have helped, but I’m going to say it was my obsession with going to the gym 7 days a week. Sure, there may be easier routes to losing weight, but I wanted what would work, and I find it sort of ironic that people will try almost anything, except for what works. Losing weight, like most things in life don’t always come easy, even if magazines, books, and nearly any other form of media will tell you that it can be easy, when in reality; getting the results you desire often requires a lot of work. Hmm…this post was not as funny as Dan’s. I remember when that happened. But then you started exercising like a freak and transitioned from skinny to not skinny to in shape, so there’s that, I guess. I’ve had quite a few discussions with a lot of people about the article that came out recently (the one I linked to in my earlier post) suggesting that people want to eat more or at least, more unhealthy options, because they figure that they are okay, since they worked out. I know this mentality. I’ve even suggested as much in justifying fatty foods (“no, it’s okay, i can eat this bucket of chicken, i went to the gym today!”) from time to time. But they seem to forget that if the actual goal is weight loss, a lot of it is simple math: you have to burn more than you consume to utilize all the good stuff you’ve stored around your waist. But to go for the shocking headline of exercise doesn’t help is simply ridiculous. Because you have to remember, on some level, it’s not just about weight loss, but also (in theory) being healthy and active and not having bodies that breakdown in your forties. I could, no doubt, stand to lose a few pounds. But I exercise regularly, and I do my best to limit the bad foods (some days are better than others). But more important to me than those few pounds is the fact that I’m actually in great health – particularly from a cardiovascular standpoint (blood pressure and heart rate are fairly low) and this aspect of my health I would most certainly attribute to the fact that I exercise as much as I can. Is it hard? Sure, sometimes. But saying that exercise makes it harder to lose weight, as that article contends, is doing nothing but feeding the image machine that makes us care more about being thin than being healthy.